Pulitzer Prize–winning author Wills (Emeritus, History/Northwestern Univ. ; The Future of the Catholic Church with Pope Francis, 2015, etc.) defends the Quran in this layperson’s review. Looking at the sacred text of Islam with unashamedly Western and inexpert eyes, the author finds that little of what most non-Muslims think about the book is true. In the first quarter of the book, Wills explains the impetus for studying the Quran: the West’s many post–9/11 blunders in the Middle East. The author does not mince words, arguing that the conservatives in the George W. Bush administration rushed into a war with a people, culture, and religion they failed to understand. 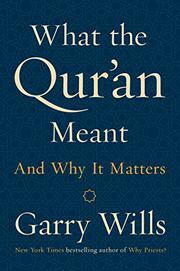 Given an age of ignorance and fear, writes Wills, “it is time for us to learn about the real Islam, beginning with its source book.” The author goes on to explore various aspects of the Quran, often comparing it to the Old Testament and often pointing out popular misconceptions and quotes taken out of context in the West. While being clear that “the terrorists in modern Islam are not knowledgeable of their own religion in either profession or practice,” Wills focuses not on Muslims who misread the text but on Westerners who misread it or, more to the point, never read it at all. He points out that in cases of less-than-kind passages, Christianity and Judaism have such lines of scripture of their own (such as prohibitions against apostasy). Wills goes further to note that harsh acts described by the Quran have been equaled or even surpassed in Christian history as well. Compare, he suggests, the Quranic rule about amputating a hand or foot with the realities of 16th-century tortures and executions of heretics in England. Wills has good reason to share his own reading and study of the Quran with a populace largely ignorant of its contents, but he does so in a vacuum, unattached from the many cultural expressions of this sacred text’s adherents.